Upper Deck Entertainment blows into the fall season with the exciting new 2005 Yu-Gi-Oh! TRADING CARD GAME Collectible Tins. For the fourth year in a row, Upper Deck Entertainment and KONAMI are releasing six special Yu-Gi-Oh! 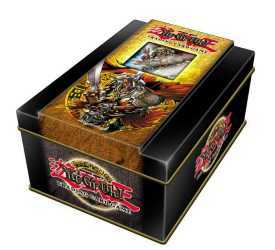 TRADING CARD GAME Collectible Tins in time for this holiday season! Available in September, the six exclusive tins will allow Duelists to make their decks much more powerful, with a collection of booster packs designed to increase the complexity and power during matches. Each tin will include five booster packs, an exclusive special card, and a nifty tin (matching the card!) to keep your Decks in. Gilford the Lightning first cleared the field for Joey in his Battle City Duel against Marik. This September, his sword can strike for you. One of Joey�s signature monsters, this Beast-Warrior has won many duels for Wheeler because of its potent 2000 Attack Points. It works great with the "Scapegoat" Spell Card from the Joey Starter Deck.